ST. JOHN'S, N.L. - A winter storm that hammered the Maritimes was swirling east across Newfoundland on Sunday bringing high winds and heaps of snow. Environment Canada metereologist Jeremy March said central Newfoundland has already been hit with 33 centimetres of snow, and can expect up to another 20 cm as snow continues to blow in. St. John's is digging out from 23 cm of snow that fell Sunday morning, and March said the area is forecast to get more snow and freezing rain as the storm pushes through. Wind gusts of more than 100 kilometres an hour were expected to pummel the country's easternmost province after ripping through parts of the Maritimes Saturday. March said Nova Scotia got some of the worst winds, with many places seeing winds upwards of 140 km/h. A spot just east of Yarmouth in the province's west was hit by extreme gusts that reached 164 km/h, which is category 2 hurricane wind, March noted. 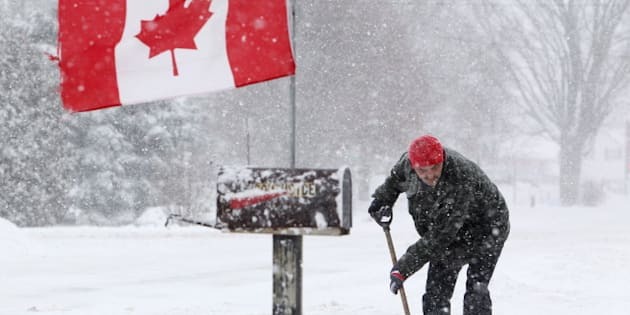 The system is a hybrid of a storm that dumped 20 to 40 cm of snow in southern Ontario on Friday and a low pressure system that raged up the U.S. eastern seaboard, March said. "The two in combination became a really intense low (system) just off the coast of Massachusetts... that did a lot of damage across the New England states. Eventually it pushed a ton of snow and wind across the Maritimes and now it's in Newfoundland," he said. Two weather systems joining forces does not generally happen throughout the year, but is far from rare in the winter, March said. "Living in Eastern Canada, we're always prone to getting these big storms." Several flights were cancelled at St. John’s International Airport while Marine Atlantic has suspended ferry service between North Sydney, Nova Scotia, and Port aux Basques, N.L. About a dozen flights were called off at Halifax International Airport, while trips arriving at Toronto's Pearson International Airport to St. John's, Halifax and Moncton, N.B., on Sunday morning were scuttled. March says the Newfoundland blizzard should be the last gasp for the hybrid storm. Nova Scotia Power said more than 20,000 customers were without electricity at one point on Saturday, but by early Sunday morning all but a handful had been re-connected. In southern Ontario, the weekend of clear skies that followed Friday's snow day is expected to be replaced by a new system bringing warmer temperatures and rain — potentially freezing rain in some central areas — later Sunday. It should then bring a "mixed bag" of precipitation into the province's east on Monday, March said. "In the middle of winter you can expect anything," he said. Temperatures ranging up to 5 C may help melt the snow, but memories of Ontario's wintry blast — in many places the biggest single dump of snow in several years — will linger. The massive storm left two people dead from vehicle collisions, while an 80-year-old Hamilton woman died while shovelling her driveway. In Toronto, which saw roughly 30 cm of snow, there was chaos at Pearson airport with numerous flight disruptions. Perhaps the most eyebrow raising case occurred with a Sunwing Vacation plane full of vacationers bound for Panama and Costa Rica. It ended up sitting on the runway at Pearson International Airport for more than 12 hours Friday, grounded by delays linked to the weather. After spending a few more hours waiting in a terminal the passengers finally departed late Friday. Sunwing spokesman Daryl McWilliams said Sunday that under the circumstances, it's not surprising the airport "wasn't working normally" during the storm. "But you couldn't blame the airport for that... it was a chaotic situation," he said. McWilliams said the passengers have been understanding, noting the airline gave them travel vouchers to make up for the unusually long wait. A Pearson spokeswoman said part of the reason for the delay was a computer glitch that disrupted de-icing operations at the airport.